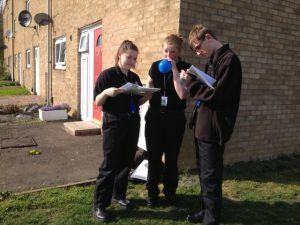 Volunteer Police Cadets helped police deliver a powerful crime prevention message as part of an operation to keep people safe in Cambridgeshire. The cadets were invited to support Operation Freeze in the Ortons area of Peterborough which involved checking the security of domestic properties and cars with their police colleagues. Where vehicles were found to have open windows or doors, the cadets posted crime prevention balloons and cards advising the owners they could easily have been a victim of crime. During the operation, which took place on Wednesday, April 15, 374 properties were checked which resulted in 75 insecurities being discovered. Meanwhile, a check of 259 parked cars in the area identified 16 insecurities. In all cases, the cadets informed residents and car owners of the potential for criminality to occur. Commenting on the event, Cambridgeshire Police and Crime Commissioner Sir Graham Bright added: “It’s very impressive to see so many young people giving up their free time to improve public safety and deliver the important messages behind crime prevention. Sir Graham has made it clear he wants to strengthen the younger voice in policing and provide a platform for young people to make decisions on future services. He also wants to support work which helps to divert young people at risk of criminality away from a life of crime. Sir Graham set up the cadet scheme last year in partnership with the Thomas Deacon Academy in Peterborough to inspire young people to participate positively in their communities and support local policing priorities. A second unit at Soham Village College is currently undergoing training and will qualify in July. There are plans for the scheme to be rolled out to other parts of the county in the future. 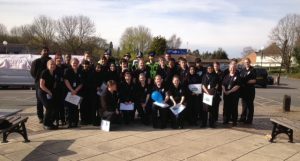 For more information about the Volunteer Police Cadets Scheme, please email: cadets@cambs.pnn.police.uk.